As much as I love to read, I have never felt comfortable with literary analysis. I have vague recollections of my high school English teacher, Ms. Nye, teaching us about symbolism in Macbeth, and I still have a paper I wrote about it (which I remember as being fabulous, but really isn't). In college, I took a "Great Books" class as a requirement for graduating with honors, and I sat in lectures, took notes, and regurgitated the professor's viewpoint into papers. If I could find a way to include women and/or minorities, I got an "A." I took a poetry class, too, and didn't leave there feeling as if I had any more of a clue than when I started. It's amazing how one can write papers without knowing anything about the topic, and still pass. I was excited, therefore, to have the opportunity to review Teaching the Classics from Institute of Excellence in Writing. 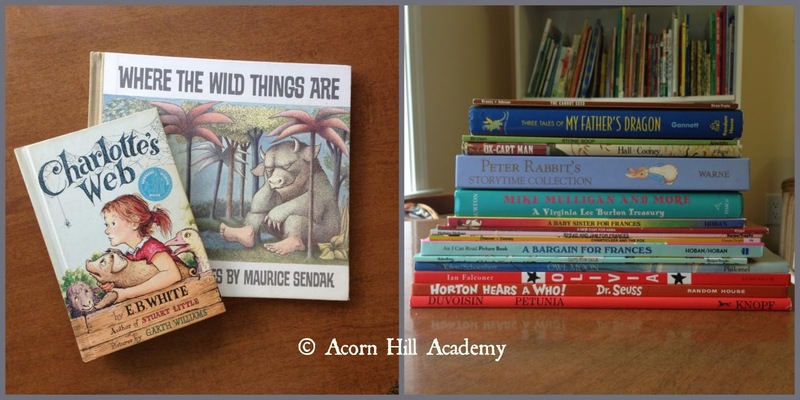 This program was developed by Adam and Missy Andrews, after they began homeschooling their six children and found that the literature curriculum scene was primarily dominated by workbooks. After working to pull material together for their own family, and at the urging of some homeschool friends, they combined their knowledge (he has a degree in history; she in English literature) and love of literature into a program they could use to teach their own children, and would allow other homeschoolers to do so. They did not want to add another thing to the load of a homeschool parent that would require starting from scratch - we've all been there, yes? Rather, this program enhances what we do as we teach our students how to think more deeply about what they're reading. 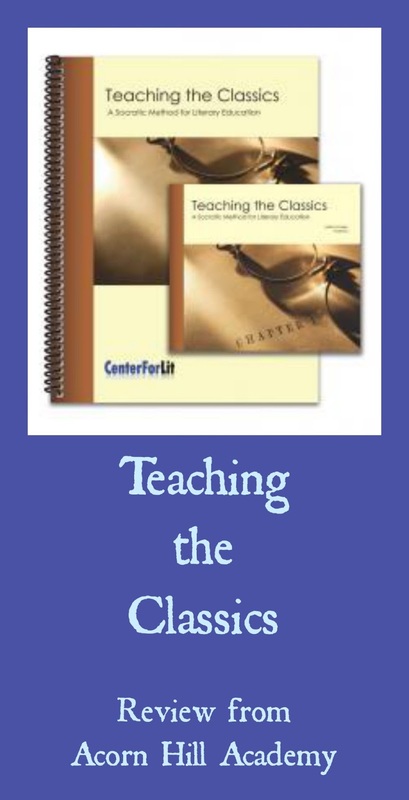 For the purpose of this review, I received the Teaching the Classics program, which includes a set of 4 DVDs (around 6.5 hours of video) and a spiral-bound workbook (extra workbooks are available). Although the course is directed at teachers, I think older students might enjoy watching the videos as well. The workbook also includes a blank copy of the fabulous "story chart,"which identifies conflict and breaks out the plot of a story; a scope and sequence for the curriculum and suggested lesson plans; and appendices including the Socractic list of questions, reading lists for every age, and a glossary of literary terms. The one minor issue is, since the recordings were done at a live seminar, the audio varies in volume sometimes. I found this much less distracting when I watched it on the computer in my office, instead of trying to watch on our television. I'd also love to see an audio recording of the course. The videos are great, but I'd love to be able to move around a little more while listening, particularly as I review the material in the future. He was an American poet who lived in New England, from 1807-1882. He was fantastically famous in his own lifetime; when he spoke, he knew the nation was listening. He was a staunch Unionist. Paul Revere's ride appeared in the Atlantic Monthly in January of 1861, shortly after Lincoln was elected to the Presidency solely by the Northern states, and 7 of 11 states had already seceded from the Union. Can you see how just knowing those three facts add an entirely new dimension to the poem? The information is easy to come by, which means you don't have to be a Longfellow biographer to find it. With little Googling, and a couple of good books, you can present excellent information to your students that will broaden their understanding of what they're reading. I've learned quite a bit about the significance of context in pursuit of a Charlotte Mason education for my children, and that one lesson clarified for me how important it really is, to know the context of a work. It helps students connect with what they're reading on a much deeper level. Mr. Andrews is quite convincing as he encourages people to start teaching literary analysis even to young children. The premise is that if you teach them basic things early on, they will have a much easier time with more complex literary analysis as they get older. That is the one of the basic tenets of classical education - hanging knowledge on "pegs" for building of future skills. For example, Mr. Andrews stated that learning to recognize onomatopoeia would help a child learn to recognize symbolism more easily in the future. He suggests beginning with children's books and students as young as 8 or 9. I'm not sure how I feel about starting with students that young. Children should be allowed to make their own connections with stories they read, and if I'm perfectly honest, it seems like it would take all the fun right out of reading about Peter Rabbit's escape from Mr. MacGregor's garden if I had to discuss conflict and plot with a young child. However, I think my girls (going into 7th and 8th grade) are ready for this kind of information, and as Mr. Andrews showed us so well in the course, children's books like The Tale of Peter Rabbit are a wonderful place to start because the concepts are so easily pulled from the stories. After years of feeling like a literary goob, I have learned tools to teach my children about literary analysis! It's a great feeling. I plan to pull together books from the lists provided in Teaching the Classics and start working on them with my girls, perhaps once a week or so. I will go gently, because I do not want to tell them what to think about a story; I want to give them tools and vocabulary to discover more for themselves in what they read. I'm not sure how far we'll take it, but I am looking forward to introducing them to the vocabulary and ideas. Teaching the Classics is available from the Institute for Excellence in Writing for $89.00. This is an excellent course to show anyone how to teach literary analysis. I'm right there with you in not thinking children so young need to be going into all that analysis. But I know when the children get older they will need to do some of this, and I am very nervous about how to go about it, because I was never great at it myself. I am really liking the look of this resource. Thanks for the great review. I think you will LOVE this program - I have always felt nervous about literary analysis too, but I feel better about it now. I hope I can make this as fun for my girls, as Mr. Andrews made his seminar.